Goodness!! This swap was so much fun to participate in!! 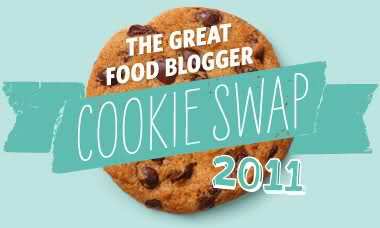 The 1st annual Great Food Blogger Cookie Swap was hosted by Lindsay of Love and Olive Oil and Julie of The Little Kitchen. Their Facebook Page said they had 625 participants. Wow. The premise of this swap was easy. Each person makes 3 dozen cookies and sends them to the three other bloggers that were assigned to them. In exchange each person receives 3 dozen cookies from three other bloggers. What a great way to unite bloggers around the world! Everyday we get to see the creations our fellow bloggers make, and salivating, wish we could pick that food off the computer screen and eat it. This swap made blogging come alive. Blogging in tangible, edible form. We get to taste each others creations. Wow. All the cookies I received were unbelievable. They were also all cookies that I had never made myself and I am so excited to get my hands on the recipes. Beautiful gorgeous absolutely delicious cookies!!! The day I received my first package from Shari at My Judy the Foodie, I was so stoked. Because, who doesn't like to having cookies delivered right to their door? These cookies were sugar cookie-like with thick chocolate frosting on the top. Divinity in a cookie. My second cookies to arrive were these babies sent by Meghan of Stir and Scribble. They were out of this world. Chocolate sandwich cookies with peppermint cream. I wanted to scream they were so good. I met the FedEx man at the door Friday morning to get my third box from Janet of Food Beautiful. I ripped into them within seconds of closing the door and found double espresso chocolate cookies. Janet, do you know how much I love espresso? How chocolate and coffee are maybe one of my favorite combos in the whole wide world? These were unreal. I kinda feel spoiled rotten. So, are you curious what I sent out the door? Cardamom Butter Cookies. Yes, Cardamom. With espresso and chocolate drizzles. These were the most delightful cookie I have ever had the pleasure of baking. I had so much fun! And knowing that three fellow bloggers I have never met were going to be eating them made this process even better. These cookies were filled to the brim with joy and love from me. I will be honest, it was a little stressful finding the perfect cookie to send my fellow blogger friends. I mean, that's what we do...what if they aren't good enough? Especially since I got one of my very favorite bloggers Scarletta Bakes as one of my recipients! This was intimidating, but exciting. I was up for the challenge. Then I came across this recipe and my fears were no more. I'm not gonna, lie...these cookies are time consuming. But, they are worth every minute of your time. They will impress people with their complex mix of spices and flavors. Plus they're so pretty! You can't go wrong. I hope my recipients love eating them as much as I loved making them. To make the cookies, whisk together flour and next 5 ingredients (through allspice) in a bowl. Set aside. Beat butter and sugar in the bowl of a stand mixer at medium-high speed until fluffy, about 2 minutes. Beat in eggs and vanilla. Reduce to low speed and add flour mixture until just combined. Form dough into 2 (12-inch) logs, about 1 1/2 inches in diameter, on their own sheet of plastic wrap. Use the plastic wrap and your hands to help guide the dough and roll, press, and square off sides of logs. Chill logs in refrigerator on a baking sheet until slightly firm, about 1 hour. Smooth logs with plastic wrap and a hard flat sided object (I used a cookbook) to square off the cookie. Chill logs on baking sheet until firm, about 1 hour (or up to 5 days). Adjust racks to the upper and lower thirds of the oven. Preheat oven to 350°F. Cut dough into 1/4" thick slices from one log and place onto 2 large ungreased baking sheets, 1 inch apart. Rewrap remaining dough and put back in refrigerator. Bake cookies, rotating halfway through, until edges are golden brown, 10 to 12 minutes total. Cool on sheets 3 minutes, then transfer to racks to cool completely. Repeat with remaining dough. To make drizzles, whisk espresso powder, vanilla, and 1 1/2 tablespoons milk until espresso powder is dissolved. Add powdered sugar and enough additional milk to make a thick pourable icing. Spoon into a sealable plastic bag and snip off a very small (about 1/8") bottom corner, when ready to use. Spoon melted chocolate into another plastic bag and snip off bottom corner, when ready to use. I have been running around seeing all these lovely cookie swap posts, but I am glad to find this cardamon cookie recipe. Ever since I made some bread with that spice, I have been hooked. This one is definitely a keeper! Ha-your recipients probably have eaten all these and were waiting for you to post this recipe. Glad you enjoyed participating in the swap-the event looks to be a definite success! Oooh, you cardamom cookies look to die for! And those chocolate coffee cookies... yumm! I had such a goof time with my first ever swap, minus the mail theft debacle! What gorgeous cookies. I know what you mean about sending cookies to fellow bloggers, it was exciting and intimidating. I am sure they were over the moon for your creations! I'm thrilled to report first hand that these cookies were simply AMAZING. Everything from the cute tin that they arrived in to the melt-in-your-mouth flavor was such a treat. Wow, these are GORGEOUS cookie! Your recipients must have been so excited. Wasn't swapping fun?!?! I can't wait to gluten and dairy free adapt this recipe. They really are top notch! Happy Holidays! Beautiful cookies!! Love the cardamom! Whoever got your cookies is very lucky! What a wonderful choice for the swap! I love how everyone made such unique cookies - I loved all three of my cookies because they were all varieties I'd never had or heard of before! Yum yum! I would never think to drizzle espresso. I think it really adds some sophistication - great job. Ohh, these cookies sound so sophisticated! Not to mention delicious. I love the drizzle on top; so pretty! I love your idea with the cardamom! Lately I've seen a lot of places using cardamom cream on desserts, but in IN the actual goods. Definitely going to add this to my "to try" list! Great cookies! I love that you put cardamom in the cookies and the glazes?!?!? Inspired! Great cookie! Cardamom is one of my absolute favorite spices. I will definitely be making these! LOVE that you used Cardamom! They look great!